of empathy in children and adults." Roots of Empathy is an innovative classroom-based program that aims to reduce aggression through the fostering of empathy and emotional literacy. 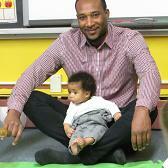 A local mom and or dad will visit the elementary school classroom once a month with their baby. 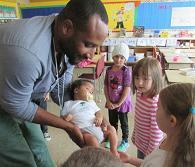 The Roots of Empathy Program Instructor facilitates the program curriculum, acitivities and partners with the school. With the support of our local schools, Brass Bell Family Resource Centre/EarlyON centres have sucessfully offered this program in schools on an ongoing basis.